I’ve wrote about light painting before and I’ll likely write more again as this really fascinates me in photography. For me it is a lot of fun playing with lights, a lot of creativity as I create something that was not there in the first place, and a lot of surprise as most of the time what I get is unexpected. Here is an image that got me very excited about light painting again. I spent a day photographing fall foliage in Kubota Gardens in Seattle (I’m still working on post-processing those photos). 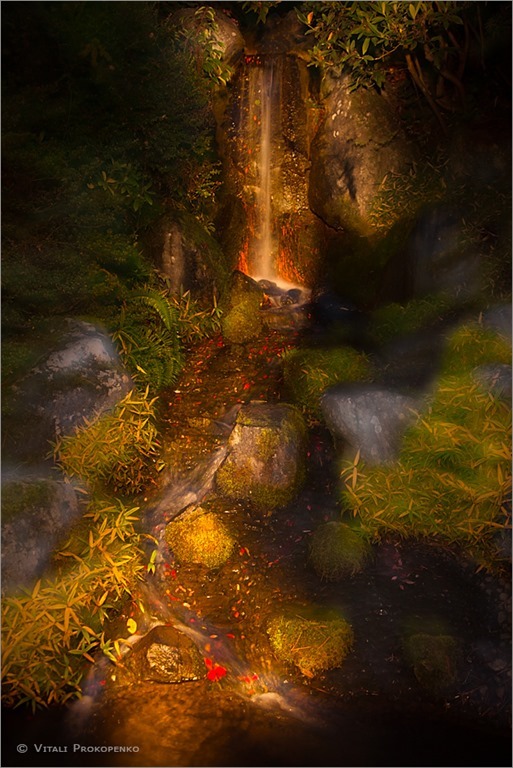 At dusk as it got dark enough for exposures to go up to 30 seconds I started playing with light painting with two waterfalls I found in the gardens. I found the upper waterfall to be more interesting of the two because it had red leaves caught in the stream and I could get a more dynamic image with foreground and background. There were two new things I played with this time. First, I brought two different flashlights: one had cool light and the other one had warm light. So, I could do not only light painting but also color painting. The other thing that I played with was focus, shifting focus in the middle of light painting. This created dreamy effect. For those interested in more technical details here is how I took this image. The camera was on a tripod, aperture wide open (f/4 for the lens that I used), shutter was 30 seconds. It was pretty dark already, my camera was not able to focus just using ambient light. First I would use very powerful warm flashlight. I would point to a rock in the middle of the frame and focused the camera using auto focus. I would turn off auto focus then. Turn off the flashlight, so it does not light up something accidentally, and release shutter. Then quickly with the same powerful warm light I would trace the waterfall and the creek back and forth a few times to ensure that individual spots or streaks of light a now visible. That was taking me about 5 seconds. Then I would turn off flashlight and defocus the lens. The rest of 25 seconds I was using weak cool flashlight to light up sides of the frame while the camera was out of focus. I did this ten times or more, every time getting a different image – I love the element of surprise. This I think is the best out of the series. It is amazing how many different photos can be made in the same spot and of the same subject. Look at this photos for example. The same sea stack at Second Beach, just different atmospheric conditions, different light and different exposure. More photos of this place from my earlier trips can be found on my website: http:///www.vitphoto.com/?folio=Olympic. Do you ever feel lost in space? There seems to be a pattern of photos throughout the years I photograph, kind of lost in space photos with a subject lost in a lot of blank space around it. Like Stillness. Lost in Fog or Lighthouse. On a trip to The Lost Coast (no punt intended) last May I took another lost in space photo. This time a lonely boat in the ocean.